With the fully functional front loader, the Claas Arion 650 gains an additional detail - the 1:32 scale makes it a complete modeling dream! Modeling beauty is typified by the numerous movable features in the Wiking precision models. Of course fans who love precision are able to fully appreciate the harmonized combination of zinc die cast and plastic components. This means that the model's hood can open - revealing the powerful engine. The cab with its reproduced luxury and technical interior is a particular source of miniature fun. The rear mirrors are movable, the cab door and rear window can open and the rear lifting hydraulics can be raised and lowered. 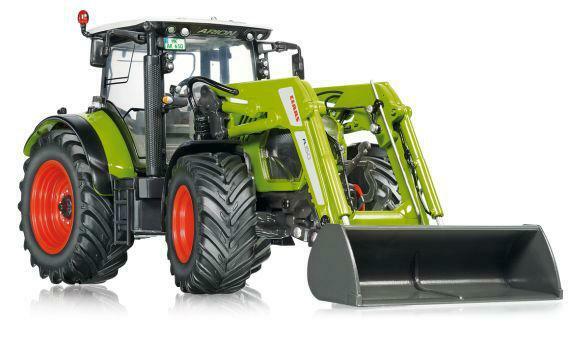 The detailed and delicate paint job means that the Claas Arion 650 model is the flag ship and completes the Harsewinkel tractor range.